We are pleased to announce the third solo exhibition by Heiko Heiko Blankenstein at our gallery. Flora and Fauna – ibex, goats and trees as a symbol for energy based in nature, architecture and consistently the Marshall-amplifier as an allegory for artificial, intellectual energy. In contrast, the hunting trophies mounted on the walls or the levitating vessels seem to originate from an in-between world. Everything seems to be subject to a curious conversion or exaggeration. The table in the living room mutates into a stage for a rock band and its plant-like protrusions intertwine with its surroundings, or it changes into a crystalline formation. Over the years, Heiko Blankenstein developed an idiosyncratic vocabulary within his surreal pictorial creations. For the first time, he now exhibits a three-dimensional drawing in combination with his large scale works on paper and lightboxes. This installation directly refers to an element already depicted in a ball-point pen drawing. Nevertheless, there is not so much the question whether the represented object manifests itself into a state of reality, but rather that an artificial inflation does occur. The table, constructed by the artist, became drawing surface. The painted white, originally wooden surface has to a large extent been covered with a new wooden texture, drawn with ball-point pen. From the table grows a tree-like structure, its crown resembling antlers and it being entirely enveloped in blue and white drawn leaves. Protruding growth, playful proliferations of organic entities as well as visionary formations which up to now exclusively appeared in Heiko Blankenstein’s pictorial work, now enter a further dimension and transport the bizarre compilations into a physical sphere. This includes that this time the, in his drawings frequently appearing Marshall amplifier manifests itself in real life. Plugged into the “tree-trunk”, this artificial symbiosis seems to produce sounds from the tree’s inside. Trough his search for increasingly new ways of bringing drawing practice into another realm, Heiko Blankenstein creates possibilities that extend its usual application. He uses pencil, colour pencil, ink as well as ball-point pen for his large-format drawings. 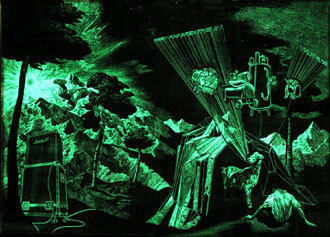 He experiments with markers for further working on the plexi sheets that he previously covered with printing inks and then engraved with stylised interiors and landscapes. The transposition of a drawn shape into a physical one is a further attempt to not only expand the concept of drawing as a medium, but also to present his illusionist compositions in a spatially experienceable way. In conjunction with this opening we introduce the catalogue heiko blankenstein – drawings, just published by argobooks.